The Atlantic Council, until recently kept comparatively in the shadows for obvious reasons, is a think tank that has more than any other organization effected the transition of the North Atlantic Treaty Organization from a seeming Cold War relic with the break-up of the Warsaw Pact and the dissolution of the Soviet Union in 1991 to the world’s only and history’s first international military network with 70 members and partners on six continents currently. All thirteen new full member states are in Eastern and Central Europe; four of them border Russia. This is by way of follow up to a Directive on Social Media issued four years ago by NATO’s Supreme Headquarters Allied Powers Europe (SHAPE), the bloc’s military command in Europe (which also oversees activities in Israel and until the activation of U.S. Africa Command ten years ago almost all of Africa). One key challenge is the need to keep informed regarding social media ‘discussions’ on NATO and global security matters in order to maintain situational awareness. Key vulnerabilities include security concerns and the ease by which information can be transmitted globally using social media tools. It also addresses use of social media for what it calls “operations,” which frequently is a euphemism for bombings, missile attacks and all-out war. Witness Operation Allied Force (Yugoslavia 1999), Operation Unified Protector (Libya 2011), NATO Training Mission-Iraq (starting in 2004), International Security Assistance Force/Operation Resolute Force (Afghanistan from 2001 to the present) and Operation Atlantic Resolve (aimed at Russia since 2015). The Atlantic Council’s Digital Forensic Research Lab is building the world’s leading hub of digital forensic analysts tracking events in governance, technology, security, and where each intersect as they occur. It accuses the Russian news outlet of menacing, egregious, Cold War-era enormities like…unbalanced coverage. That animal, of course, is not known in the US corporate media. Indeed RT is not an American outlet. In fact all of its features on YouTube have under them the small-case letter i in a circle followed by “RT Is funded in whole or in part by the Russian government,” with a Wikipedia link. The Atlantic Council item is transparently biased itself, as RT routinely runs news critical of members of both major US political parties. The author of the piece focuses attention on November’s elections (“attempting to influence American elections through editorial bias,” above), yet he bemoans allegedly less-than-kind portrayals of Hillary Clinton (whose first name is consistently spelled Hilary), who last heard is not at the moment running for public office. That is, bring Georgia and Ukraine into NATO as full member states and court a US-Russia war with all that would entail. I also want to pay tribute to my fellow honorees here tonight for the contribution they have made to the success of freedom – from here in Poland, to neighboring Belarus, to farther away in Egypt. These champions of liberty are the defenders, supporters, and authors of peaceful democratic revolutions – both those that have been successfully made and those, as in Belarus, that have yet to come, but surely will…. 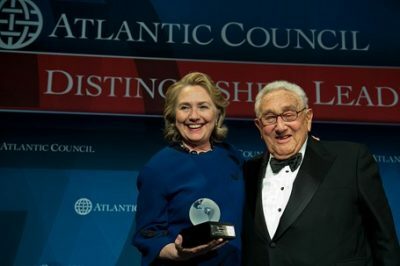 It’s more than American elections that the Atlantic Council and its social media partners intend to influence.